Antique Regard brooch in 18ct gold. Product code: ES2494 Categories: Sold Items, Sold Jewellery. 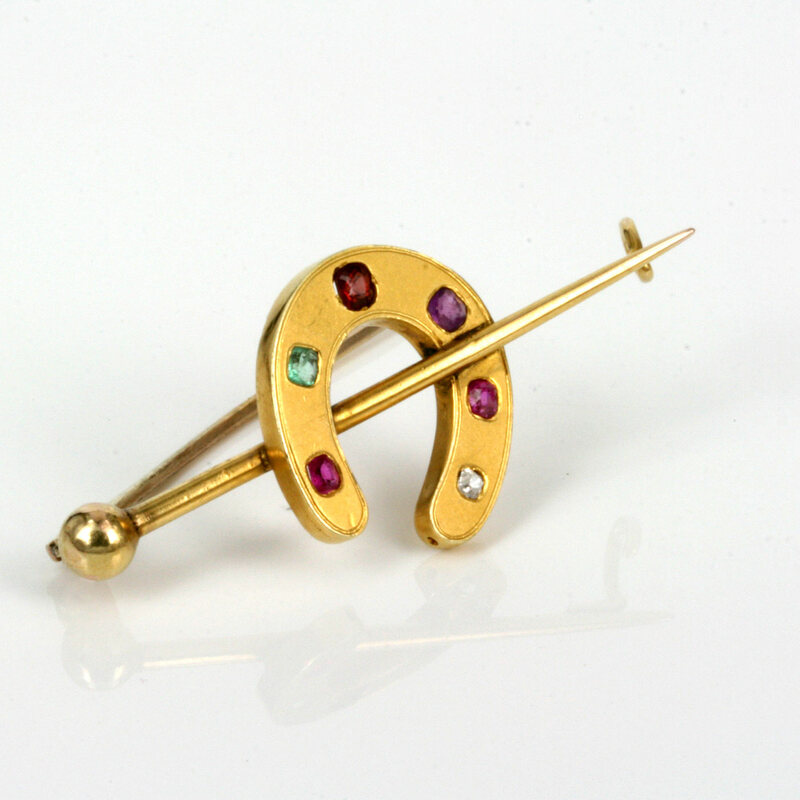 “Regard” jewellery is so romantic and delightful in its form and colours and any Regard jewellery is becoming so hard to find, so it is wonderful to obtain a delightful Edwardian era Regard brooch in the form of a horseshoe. Regard jewellery can easily be characterised by the use of gemstones whose first letter spells out the word “regard” as can be seen here with the gemstones ruby, emerald, garnet, amethyst, ruby and finally a diamond. The sentiment behind this jewellery is so romantic and typical of the Victorian and Edwardian eras. Made in 18ct yellow gold in the early 1900’s, this horseshoe regard brooch measures 5cm across and will look superb on any jacket. The horseshoe is displayed in its correct form of down to spell the word regard with the gemstones as opposed to the later way of hanging the horseshoe up. This is a wonderful piece of Regard jewellery and one that will always be admired and commented on.